We left the troll unmolested and started a gradual climb along the south bank of the Suiattle River. Soon we found ourselves in a grove of enormous trees known as the Garden of the Gods, a stand of virgin forest containing ancient cedars that are hundreds of years old with trunks 10 to 15 feet in diameter. It was awe inspiring to be present with these giants, if only for a brief walk. From there we started to our climb up along Vista Creek. We reached our "B goal" campsite early in the afternoon, and decided it'd make a perfect spot for early hot dinner (okay, hot 2nd lunch as it was only 2pm). After a pleasant meal in dappled sunlight we made our way another 3 miles up the trail, gaining another 2100 feet of vert, to our "A goal" for the night. The campsite was ideal, protected on three sides by trees with stunning views of nearby Ptarmagin Glacier. We had just set up our tent and were getting situated to make some miso and hot drinks when 4 friends crested the hill: Grim (that's Mr. Reaper to you), Beanstalk, Dustin, and Jaimie (no trail names yet). They had left Stehekin a day behind us, and were pushing a good pace. We chatted for a little bit, and learned they were planning to camp a few miles further along. With less snow than we had expected and making decent mileage ourselves, we realized that we were either going to camp every day in the early afternoon or hike further than outlined but end up with a day or two to lollygag before our next resupply. Dustin kindly let us use his InReach to send a satellite text message to my sister-in-law to adjust our Stevens Pass meeting time to a day earlier, eliminating the problem. The next morning was stunning. There were some high clouds and a low fog was hanging in the valley. Around us were numerous peaks and crags that had been obscured by clouds the night before. We set out with high expectations that Day 12 would be a stunner. We rounded a corner and surprised two young bucks who bounded across a nearby knoll then headed up a large snowfield to get away from us. Over the next rise we had a clear view of distant Mt. Baker. After a few more minutes we came to the edge of a large alpine basin with Ptarmagin Glacier high above. It was a picturesque spot, with rivulets of snowmelt and glacial streams cutting through talus, wildflowers, and trees. These first 2 miles took much longer than usual because at every turn we had to stop to take in the views. Not long after we left that magical basin behind us, we crossed the ridge marking the 2000 ft descent to Milk Creek. The view from the switchbacks down to Milk Creek. We have a long way to go down. After a long descent through endless tortuous switchbacks on the steep slope, bushwhacking much of the time through the overgrown vegetation obscuring the trail, we arrived at the bridge over the aptly named milky glacial creek. After a quick snack of homemade energy bars, we started up the long climb to Mica Lake. Unlike our recent descent, these switchbacks were primarily through forest and rock rather than dense vegetation and seemed quite civilized by comparison. A light rain started as we left the bridge and continued as we climbed, but didn't bother us much. About three-quarters of the way into our climb the trail opened up into a high basin with a cascade of the lake's outlet and another delicate alpine meadow. From there onward we were out of the forest and had good views towards our destination, but also of the darkening skies above. Finally, we crested to Mica Lake, a deep blue gem set in a stark cirque of dark rock and low trees, with large snow fields extending down to the lake whose surface was still covered by a large cap of ice. Just then the rain got much heavier, and we saw our 4 friends from the night before huddled under overhanging rocks and trekking umbrellas, eating lunch. They let us know our satellite text had gone through and we joined them for a snack break. Over the rise we saw Michael (F-Stop), who had passed us in the rain back at Miner's Creek and had been ahead of us since then, and Liam. Just then the rain became a lot heavier. The 8 of us hunkered down to finish eating and wait for the rain to let up. Instead, thunder boomed and hail started to fall. We commiserated together for about 15 minutes in the downpour. As soon as the rain lightened up a bit we took advantage to grab another warm layer from our backpacks then F-stop, Cheri, and I decided to continue the climb up to Fire Creek Pass. We left in thick clouds and fog, with continued wind, rain, & generally unsettled weather as we made our way up and over the pass and continued onwards, with some occasional route finding, alternately losing and finding it again across snow fields and in the dense mist. 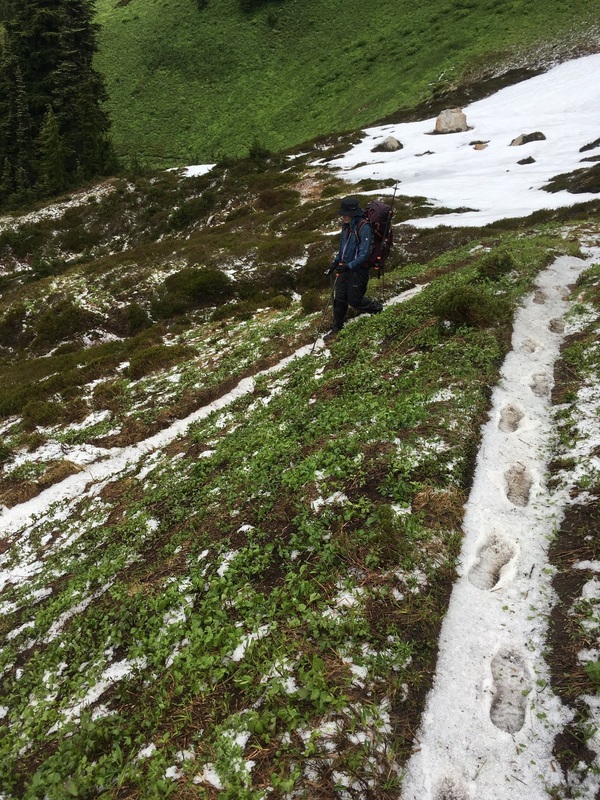 The deluge finally stopped and we made good progress along the forested slopes over a trail newly covered in hail. 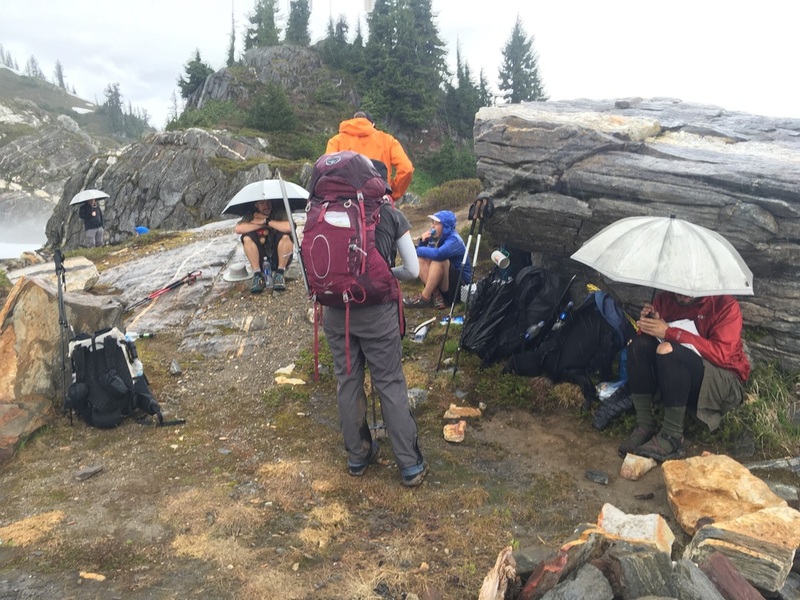 The others caught up with us and we all made a plan to camp at Sitkum Creek. In the last stretches, everything on the ground was moss coated and it gave the forest a lush and exotic appearance. Hail covering the trail after Fire Creek Pass. We reached camp as Grim and company had just finished setting up tents & hammock in a suboptimal site that had been inundated with blowdown. At least there was some low angle sunlight as we set up our tent and it gave us all a chance to dry out a little. F-stop came in a bit later and set up across the river. There was no rain overnight and the morning started out with promising weather. We reached Baekos Creek in full sunlight and we enjoyed a brief respite in the sun, even taking off shoes and damp socks (unusual for such an early stop). Next up would be Red and White passes, said to carry the most difficult snow so far.